The Genting Casino is run and managed by Genting Group, a group that has been in the casino industry for the past 45 years. The Genting group has a track record of managing some of the most successful land-based casinos in Australia, Asia, and the United Kingdom. It is an online casino that is owned by Genting Alderney Ltd, and it is fully licensed in the territory of Alderney. Why Play at the Genting Casino Online? The online casino website offers services through an up to date software as well as well trained, qualified and professional live casino dealers. It also has an effective customer care team that handles all your casino problems and concerns. The online casino is TST certified and uses an encryption system, which ensures that all the details you provide on the site, as well as your gaming time at the site, are safe and secure. There are also more than 100 online casino games at a Genting casino that you can access at any time of the day or night. For slots lovers, you can get confused on the casino games that you can select as the online casino has over 300 titles from reputable online casino software developers such as Playtech, Amaya, Ash Gaming, Novomatic, Bally Technologies and IGT. At the online casino, you have an option of playing the casino games through your mobile device or your computer. It has an application for iPad, iPhone, and Android devices. Genting casino main software provider is Playtech, one of the online casino industry biggest contributor. This should make you look forward to a smooth and sleek play at the site. Other software providers that power the games at the site are Amaya, Ash Gaming, Novomatic, Bally Technologies and IGT. Thanks to this software providers, players can now have access to over 300 online casino slots games. Highlights of some of the most popular and played games at Genting casino include The Avengers, Spiderman, The Incredible Hulk among others. By playing the mentioned games, you increase your chances of winning the Marvel Ultimate Power Progressive Jackpot. In addition to the jackpot, Genting has the cult classics such as Cleopatra and Siberian Storm which also give you a shot of winning life-changing amounts of money. If the mentioned games aren’t your preferred choice, you may want to try the titles from the IGT. This includes the space-age adventure Apollo Rising, Pharaoh’s fortune, and the vamped up fairy tale, Miss white. As for the Novomatic themes, they have their famous games such as Lucky Lady’s Charm, Lord of the Ocean, and the Book of Ra Deluxe. With the live online casino services being a big hit in Genting’s heartland of Asia, you would expect good things from the casinos live dealer games. I am happy to say that the online casino's comprehensive selection of live online casino games makes it a good place to take your very first dip into the live online casino games. From the images below, they have three versions of the live roulette, blackjack and casino poker. The roulette games include both the European and American roulette versions. You can kick start your betting and gambling career at Genting casino with the exclusive bonus that they offer their players. For the first deposit, you make at the site; you are awarded a 200% match deposit up to a maximum of £200. Therefore, to get a maximum bonus, you will have to make a deposit of £50. The wagering requirement or play through requirement of the £200 bonus is 25× inclusive of the deposit and bonus. You have to ensure that the play through requirement is met within the first 30 days. Additionally, the 200% match deposit is only available if you make your initial deposit to the casino through a credit or debit card. It will not be applicable if you make deposits to the site using any eWallet available at the site. Besides the bonus, Genting online casino is known for having a working loyalty points system. As a member who is enrolled in the Genting online loyalty scheme, you receive 10 Genting points for every £100 that you spend at the site. This points can eventually be converted to real money. Additionally, they also have a high rollers section where the big spenders can enroll and enjoy other benefits that the regular casino players cannot. Genting’s land-based casino services give them a solid foundation when it comes to offering the VIP services. London-based casinos such as Maxims, Palm Beach, and Crockfords are just some of the few casinos that are operated by the Genting Group. These casinos are known to offer some of the most exclusive and best online casino VIP services. It's from these casinos that Genting casino online has borrowed the VIP program from. However, they have very strict rules and regulations in terms of who will be admitted to the VIP section. 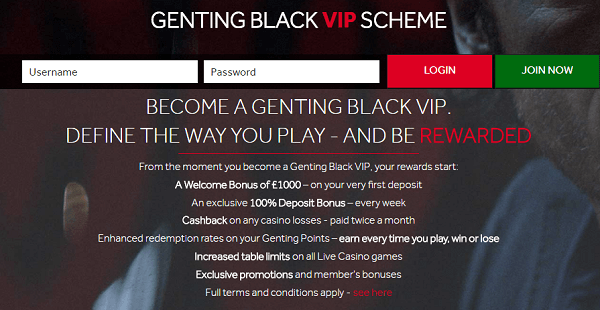 The Genting Black VIP program is by invitation only meaning that you have to prove to the casino's management that you really deserve to be enrolled at the club by spending money right. If you are the player who is looking for one of the biggest payouts in terms of jackpots, you should try the Genting progressive jackpots. The online casino has 20+ jackpot games that cumulate to up to £5 Million per game. One of the most popular jackpot game is the Beach Life Slot which paid a whopping £3 Million at a go to a 30-year-old at the casino. Additionally, sums such as £500,000 are regularly won by players at the site.